The Trump Administration’s first 100 days are well underway, and still many nonprofit communication teams are unsure of how to react. 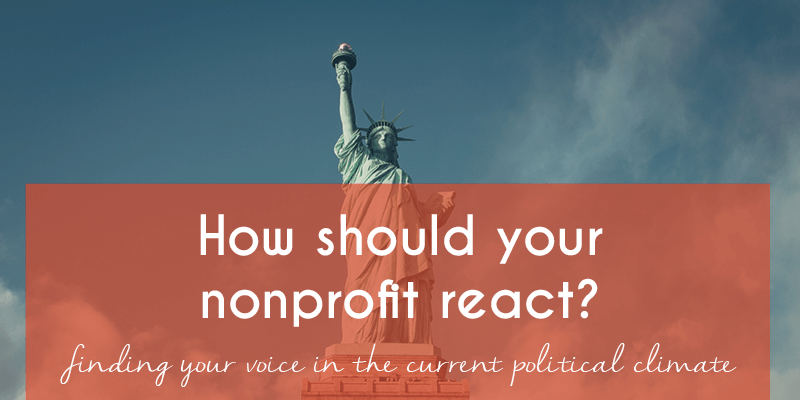 I thought it’d be wise to gather the opinions of many nonprofit experts and share some inspiration. Through reading their wise words, it’s possible that your nonprofit’s goals, positioning and messaging for the next four years could become clearer. Here are some questions your nonprofit may be asking and the way that nonprofit experts are responding. What will donors do with this unpredictable economy? How can we still rally their financial support? Since so much is changing in the world, donors may see nonprofits as a source of stability. If they are reminded you’re still there to help, they may see you as an avenue to make changes. Through your nonprofit, they have control in an out of control time. How can you ensure your community isn’t hurt by Trump’s policies? Take advantage of this heated political climate to really hone in on the needs of your community. Instead of getting too caught up in the politics, think about the people and how you can best serve them. Nonprofit Quarterly finds it important to focus in on your team and to get on the same page. They encourage nonprofit teams to work together, innovate and make changes. What should your messaging be as you attempt to rally support for your cause? Rather than trying to comment on every single activity occurring on Capitol Hill, focus on what your audience is saying and speak to those desires and needs. Media relations expert, Peter Panepento discusses the “two Americas” we now have and how many nonprofits find themselves trying to bridge the gap. He sees it as a chance to get to know our audience’s motivations and to truly speak to their goals. Despite current state of things, remember your nonprofit’s goals. Your cause hopes to benefit people, no matter their political opinions. The more your nonprofit can focus this time on listening to the needs of your whole community, the greater your impact will be.